The Image Viewer can be used to display images in the following formats: bmp,dib,gif,jpg,wmf,emf,ico. 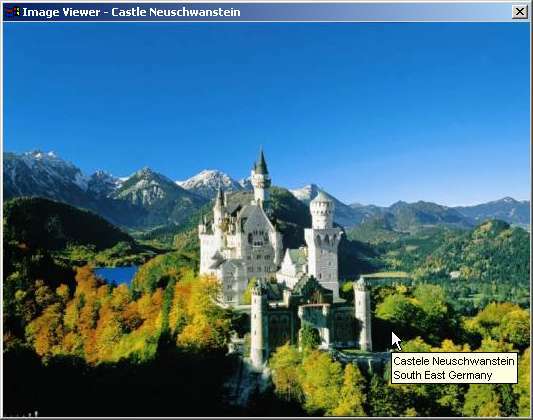 /T="Castle Neuschwanstein" /I="Castele Neuschwanstein <BR>South East Germany"
If parameter "/F" is specified, the viewer will fill the entire screen, otherwise the viewer will be the same size as the image. If the image is larger than the screen, the image will be displayed on a smaller scale.